Publish cartoons offensive to every religion. On December 12, 2010, a suicide bombing was committed in central Stockholm by an Islamic terrorist who denounced the Swedish government for its “foolish support for the pig Vilks.” Vilks was the conceptual artist who had, in 2007, depicted the Prophet Muhammad as a “roundabout dog,” familiar to tourists as a street display in Sweden. This had led to an outcry by outraged mobs in Islamic countries and occasional death threats by zealous Muslims (most definitely not to be confused with vast numbers of moderate Muslims). The terrorist found it intolerable that Prime Minister Fredrik Reinfeldt would not intervene to deny Vilks the right to draw and to publish his cartoon. Mr. Reinfeldt had in fact been preceded in this principled stance by Prime Minister Anders Fogh Rasmussen in Denmark, when mocking cartoons about the Prophet Muhammad were published in Jyllands-Posten in September 2005. 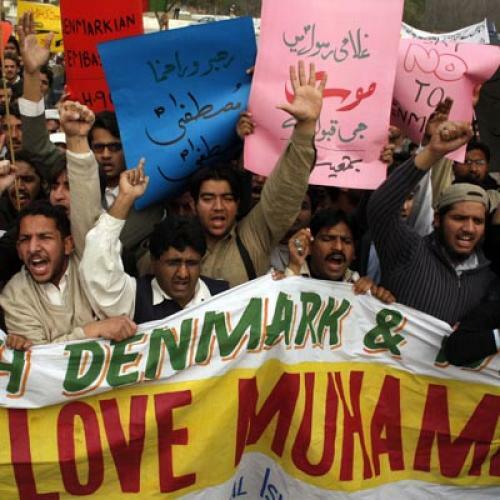 He too had refused to yield to demands from the Muslim streets and from non-secular Islamic governments such as Pakistan and Iran—accompanied by threats of economic retribution against Danish companies and incendiary mayhem against Danish citizens and embassies—for censure and censorship of his country’s newspapers. And now we have a foiled plot by Islamic terrorists, residing in Denmark and Sweden, who aimed to bomb the Jyllands-Posten building and its occupants in a Mumbai-style attack. This plot was also inspired by anger against the refusal of these Scandinavian governments to censor their media and cartoonists. In each case, however, the principled defense of the right of free expression, indeed of what we might call the “right to ridicule,” has been largely left to these admirable prime ministers from small Scandinavian countries. The only important non-Scandinavian stateswoman to have come to the defense of this right has been Chancellor Angela Merkel, who just received the prestigious Medal of Freedom from President Obama. She spoke at an event in September 2010 at Potsdam, where the Danish cartoonist was awarded the M100 Media Prize 2010, declaring emphatically that “it is irrelevant whether his cartoons are tasteless or not. … Is he allowed to do that? Yes, he can.” By contrast, the leading English-speaking governments have generally failed to express solidarity with the Scandinavian governments and cartoonists, either by words or by actual actions that would cushion them against the threatened economic retribution. In addition, the same asymmetry—of courage in Europe and caution in North America—was to be witnessed in the way that newspapers addressed the matter. Several Swedish and European newspapers reprinted the offending cartoons, but the leading newspapers in the English-speaking world did not, even though they ran stories on the episode. They defended this failure by saying that they hoped not to offend Muslim readers. But newspapers surely offend some religious group or another all the time. So what can we do? How can we begin to reverse this stifling state of affairs, without appearing to wage a culture war against Islam? Even if these newspapers were to reprint the Scandinavian cartoons, many Muslims would not make the distinction between this gesture being anti-Muslim and pro-freedom of expression. I have a modest proposal. The solution has to be to print these cartoons, but publish alongside them some of the equally mocking cartoons against other faiths—such as Catholics and Hindus, for instance—which are readily available. That would drive home the point that the key issue is not hostility to Islam, but affirmation of the freedom of expression, on which we will not compromise; that mockery, jest, and ridicule against any and every religion are part of the fabric of our life that we will defend without compromise. While the World Association of Newspapers did issue a statement in 2007 condemning death threats against Vilks and supporting the right to publish, we need a more dramatic type of action. I call upon the media in all the democratic countries, including The New Republic magazine and publishers in the Islamic countries whose people have been turning to the universal values of democracy, human rights, and freedom, to unite and declare a day in 2011 (perhaps August 15, which is the day that India, for a long time the only example in the developing world of democracy and associated rights, gained independence) as Freedom of Expression Day, and publish in unison a common set of cartoons mocking different religions, with a ringing statement that no newspaper or magazine will ever be allowed to be singled out for retribution for its adherence to the important value of freedom of expression. That would be a fitting statement of solidarity with spirited and principled leaders such as Prime Ministers Reinfeldt and Rasmussen, who refuse to bend before the threats to their countries. Jagdish Bhagwati is a university professor of economics and law at Columbia University and senior fellow at the Council on Foreign Relations. He has written extensively on secularism and religious freedom.